If you are just learning about GMOs for the first time, we know you have many questions. We have compiled some resources for you. If you already know about GMOs, use these videos and spread the word and create an event or a group to march together! Find out more about the world's largest producer of GMOs, Monsanto. Mom Zen Honeycutt Explains GMOs and health risks in 6 minutes: Most Recent info on Glyphosate (Roundup sprayed on GMOs) included. To get Robyn O'Brien's book "The Unhealthy Truth" click here and go to "Writing"
When CNN aired the Oregon GMO Wheat Mystery piece by Stephanie Elam on Monday, June 17, 2013, it was a giant step for Mom-kind. Click here for the CNN clip on "The Situation Room"
The latest information on Glyphosate ( Roundup) which is sprayed on GMO Roundup Ready food- soy, canola, and cotton (cottonseed oil common in restaurant frying oil) from the Samsel and Seneff paper is astounding. "We are creating this" are his last words on this video. By feeding our children 31.5 million GMO school meals a DAY, even more hospital and daycare center meals, by eating the 160 foods that are contaminated with glyphosate, click here for the list , by eating the 80% of our fast, cheap, easy and tasty food that is GMO and therefore heavily doused in glyphosate and contaminated at levels thousands of times higher than what has been shown to cause breast cancer....we are creating this. Chips, soda,french fries, corn tortillas, candy, snacks, cookies, breakfast cereal...anything with corn, soy, sugar, wheat, high fructose corn syrup and hundreds more ingredients, are 80-90% likely to be contaminated with glyphosate and contributing to this disaster of a health crisis we are experiencing in America. To add insult to injury, the EPA just raised the allowable levels of glyphosate despite thousands of comments against this pandering to big chemical companies. Find out more on our two-part blog interview with scientist Anthony Samsel. Click here. 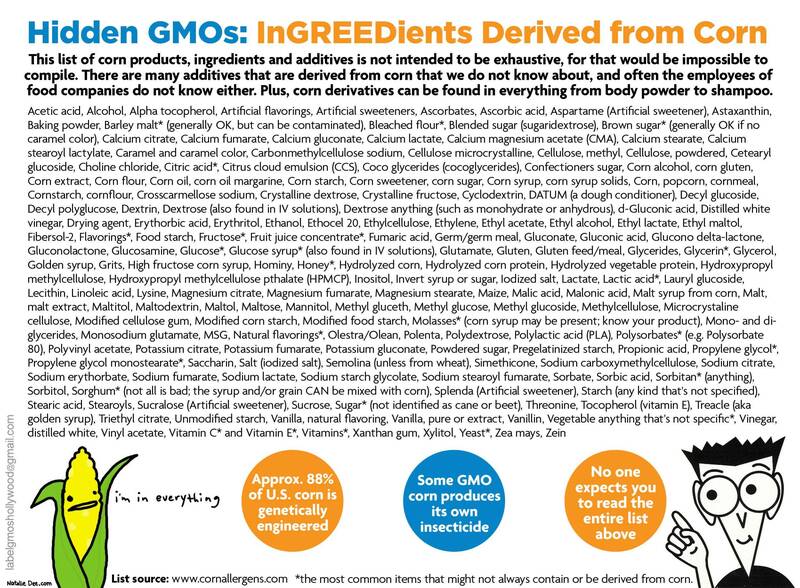 Our WA MAAM Mom Laurie Olson's List of the TOP GMO Info and health-related movies! Links to let the nation know that we have a right to know about and freedom to eat GMO Free! This is an ongoing list. Visit us again for updates. The reason why the health statistics of the United States are so bad is because we do not have the single payer system that every other industrialized country has. Autism, like colorblindness, hemophilia, and many other things is totally genetic and has nothing to do with anything that happens to a person after birth. Glyphosate is very harmful to humans, but this is a separate issue. You can have GMO’s without glyphosate and you can have glyphosate without GMO’s. For more information see http://www.theskepticsguide.org/podcast/sgu/527 48:20 Dr. Steven Novella’s commentary in this segment is especially good. He answers years of anti GMO arguments people have sent him. Saying that GMO’s do not occur in nature is nonsense. Viruses do this all the time and have been doing it for over a billion years by taking parts of DNA from one species and inserting it into a totally different species AT RANDOM. All species, including humans have been genetically modified in this way. During an exclusive interview on the Progressive Radio Network on September 4, Samsel stated that Monsanto used an industry trick to dismiss evidence about glyphosate’s risks in its own research. “Monsanto misrepresented the data,” says Samsel, “and deliberately covered up data to bring the product [glyphosate] to market. In order to minimize and cancel out its adverse findings, Samsel explained that Monsanto had relied upon earlier historical animal control data, toxicological research with lab animals afflicted with cancer and organ failures, completely unrelated to glyphosate. In some cases the control animals displayed kidney, liver and pancreatic diseases. Many of Monsanto’s own studies required the inclusion of extraneous studies in order to cancel out damaging results. This is not an uncommon industry trick, particularly in toxicological science. It enables corporations to mask undesirable outcomes and make claims that observable illnesses and disease are spontaneous occurrences without known causal factors. Samsel found other incidences in Monsanto’s data where 5, 7 and in one case 11 unrelated studies were necessary to diminish the severity of its own findings. In effect, glyphosate received licensure based upon a platform of junk tobacco science. By ignoring cause and effect relationships behind the onset of multiple cancers Monsanto engaged in a radical scientific denialism that has since raked in tens of billions of dollars. But the cache of Monsanto documents, after Samsel’s and Seneff’s review, reveals much more that we should be worried about. Monsanto’s studies included doses from low to high range. Samsel observed that low glyphosate doses were equally if not more toxic than higher doses. The company later discontinued low dose trials, relying only on higher levels because it is customarily assumed to have greater toxicological risks. Samsel’s observation has recently been confirmed by a study published in the August issue of the Environmental Health Journal by scientists at Kings College London and the University of Caen in France. The two year study found that glyphosate administered at an ultra low dose of 0.1 ppb (the EU’s safety limit) in drinking water altered over 4000 gene clusters in the livers and kidneys of rats. These alterations, the study reports, “were consistent with fibrosis, necrosis, phospholipidosis, mitochondria membrane dysfunction and ischemia.”14 Consequently low doses of Roundup are far more toxic than US EPA limits. People talk about a ‘scientific consensus’ on climate change. Yes I understand that. But to talk of a scientific consensus on GMO’s is not the same – all you have to do is go down to the lab and test it! The biggest study on GMO’s ever undertaken showed very bad results for the GMO industry. It was completely independent too. And it was the first ever 2 year study (life of the rat) and it found severe kidney deficiencies and hormonal disturbances such as breast rumours were caused by consumption of Roundup as well as the genetic modification of the corn. The new two year Seralini study was then published by Elsevier as a proper peer reviewed study but in an extraordinary turn of events was later retracted by Elsevier by the editor Dr Wallace Hayes. The reason Hayes gave for the retraction of Seralini’s Study was very confusing! “no evidence of fraud or intentional misrepresentation of the data” and nothing “incorrect” about the data. Hayes states that the retraction is solely based on the “inconclusive” nature of the findings! This is extraordinary since ALL peer reviewed papers are probably inconclusive in one way or another and therefore they should all be retracted!! Hayes’ new boss was of course – you guessed it – previously employed by Monsanto!! I love this page on the MAAM site. These are some really terrific and very informative short videos and a difficult subject. These will get you up to speed if you are new to the information and clarify things if you are not new to it and you might learn something new. Until I saw Zen’s talk with Anthony Samsel I didn’t know that farmers were using Glyphosate as a drying agent.